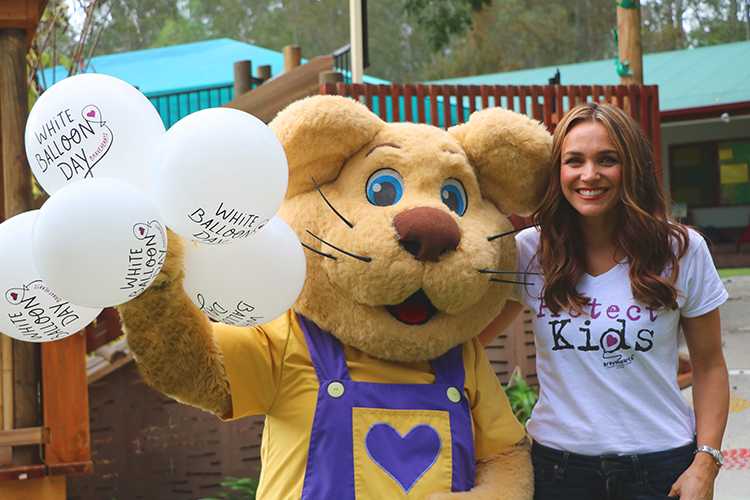 Above: ‘Ditto’, Bravehearts’ mascot and star of acclaimed educational show ‘Ditto’s Keep Safe Adventure’, with White Balloon Day Ambassador Natalie Gruzlewski. “I cannot be more proud of Bravehearts and its incredible array of supporters, all coming together to take on Australia’s biggest child protection challenge,” said Bravehearts Founder Hetty Johnston AM, as registrations pour in for the 20th annual White Balloon Day on September 9. Communities from right across Australia are signing up for the challenge, working together to help Bravehearts prevent a crime which affects more than 60,000 children every year. The milestone awareness and fundraising campaign invites schools, organisations and everyday people to join Australia’s Biggest Child Protection Challenge at whiteballoonday.com.au. Held annually during Child Protection Week (September 4-10), White Balloon Day encourages Australians to play their role in creating child-safe communities. “It is likely there is a child in everyone’s life, or the life of someone they know, who has been a victim of child sexual assault,” said Ms Johnston. “White Balloon Day is about encouraging people from all corners of the community to step up for these kids, raising awareness and funds to enable the continued delivery of vital support and prevention programs, while giving kids the confidence to come forward and break the silence. Money raised throughout the campaign will go towards education and training programs as well as specialist support for kids and their families. Funds raised in 2015 helped to educate around 106,000 kids with personal safety and support 3750 kids and their families with specialist counselling services. Bravehearts is offering this year’s biggest ‘children’s champions’ – the school, organisation and individual who accepts the challenge and raises the most funds – the opportunity to have the ‘Ditto’s Keep Safe Adventure’ delivered to a school of their choice. White Balloon Day ambassador Natalie Gruzlewski recently watched the show and urged everyone to get on board. “The work that Bravehearts does in the community is just incredible and I’m continually inspired by the difference this organisation makes in the lives of so many children and families,” she said.